Earlier this week I got an email from Chobani about a new campaign were they encourage us all to "'crunch the numbers' by dedicating themselves to living life a little lighter. Whether it’s 100 more stairs a day or 100 less calories." 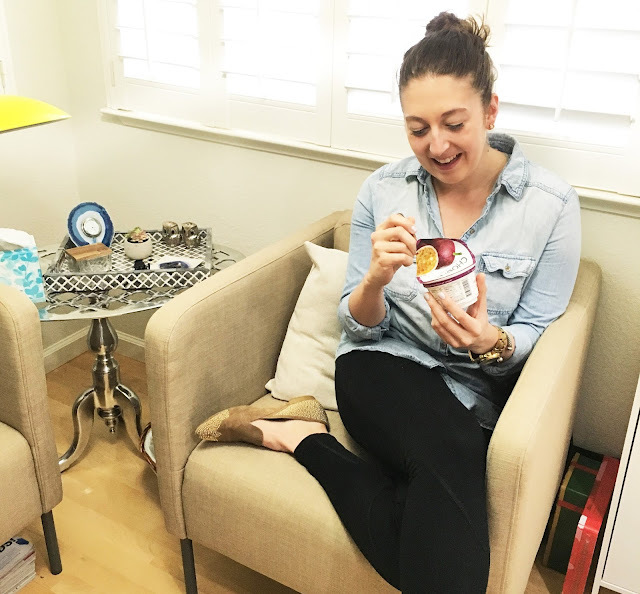 Since I love being fit and active and there were four cups of Chobani yogurt in my fridge I was thrilled to participate and share a few of my favorite ways to burn some extra calories and live a healthier life! Of course, the best way to burn calories and work up a sweat is to hit the gym. I workout with a trainer (Matt and Tessa) twice a week and do my best to squeeze in a spin class on Monday nights. Then I have a few go-to home workouts that I love to do in my house/garage in the evenings! I love doing Mondays with Matt workouts (This is my current fav!) and Blogilates, too! But sweating it out in the gym or in your house is not the only way to burn a few extra calories in the day! Get outside!! I love going on a hike! There's a great trail close to my house that I, admittedly, don't utilize enough, but when I do I feel amazing. There's the benefit of getting some fresh air, soaking up some sun and vitamin D, plus if you're going up hill you're definitely going to get an awesome workout! I love adding in a few lunges as I go uphill. It adds some extra lower body work to your cardio activity! Just make sure you have a snack with you and some water! Once you get to the end of the trail or the top of the hill a refreshing sip of water is a must. Hit the mall and do some shopping! Walking the mall and carrying all those shopping bags definitely burns some calories. Apparently 100 calories in 38 minutes! And I'm pretty sure my shopping excursions last longer than that! So grab some of your girlfriends and your trusty credit card and go get healthy and buy some new clothes. Plus, you can shop for some cute new workout clothes to really stick to your healthy lifestyle! Now, when someone gives you grief for shopping you have a pretty good excuse! Just a tip for getting really fit: Shoes weigh more than frilly tops, so adding a few new pairs of to your closet is a perfect way to get toned arms (see another great excuse)! Bake a treat and give it to a friend! Baking might seem counterproductive when you're trying to be healthy, but trust me it's a pretty great calorie burner. I love baking and while I do have a sweet tooth, I've found that if I bake with the intention of giving the final product away I get to enjoy a favorite hobby of mine AND I'm not tempted to snack on it! Moving around the kitchen (and cleaning up the mess afterwards) can keep you on your feet for a couple of hours. I keep all the flour and pans in low shelves, so while I'm baking I also work in a few squats! Not only are you burning your extra 100, but you're going to put a smile on someone's face when you deliver those homemade treats! Then invite them on a hike so you can spread your healthy lifestyle around. What are you're favorite secret ways to burn a few calories? Thanks Chobani for including me in your campaign!